Readers will know I am huge fan of Jordi Savall’s idiosyncratic commitment to tactile product in the form of gorgeous CDs with lavish accompanying books. But this is ridiculous… Jordi’s record label Alia Vox has set up its own online store, and currently has some tempting deals on back catalogue. One disc filled a gap in my collection so I ordered it. 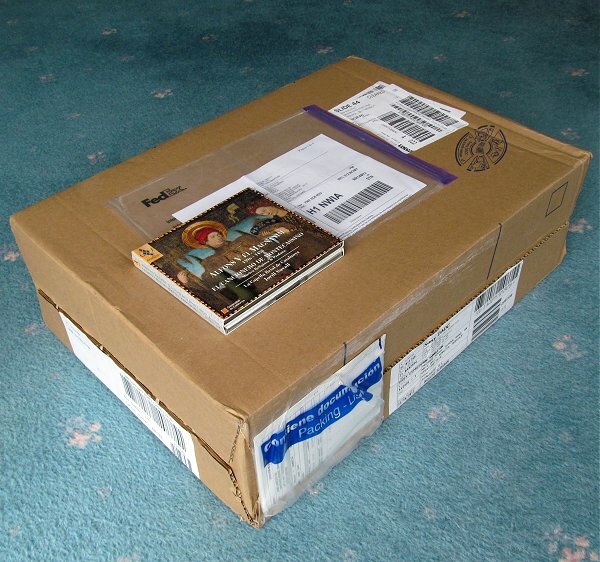 A few days later a parcel was delivered by FedEx from Spain. My photo shows the single CD with the box it came in. As I wrote here a few years ago, I have seen the future and it is cardboard. In the spirit of your post about agents facing the axe, phasing out the tactile product is a great way to cut expenses and better face the crisis. Think about it: Manufacturing costs, Shipping costs, Storage costs, distribution costs... among others! And I won't speak about the environmental issues linked to CD manufacturing. Or the fact that when you move often, digital formats are life savers! Or that you can have an even better audio quality with certain digital formats.